Each project presents its own set of challenges. From the preliminary idea stage to the execution of the final concept, a balance of subject matter, color, lighting must be achieved for the artwork to successfully stand on its own while enhancing its surroundings. Research, consulting with the client (and designers if needed) for themes which may be suitable for the proposed work site. It is very important to have the artwork fit in with existing interior design scheme. 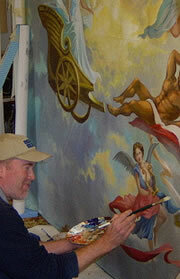 In many cases, the client and artist agree to primary theme and allowances for artistic decisions to be made by artist. Before reaching the completion stage, the project will be reviewed for final touches, assessment of overall effect.